South Korean Unification Minster Cho Myoung-gyon proposed high-level talks at a press conference today. SOUTH KOREA HAS proposed high-level talks with Pyongyang on 9 January, after the North’s leader Kim Jong-Un called for a breakthrough in relations and said his country might attend the Winter Olympics in the South next month. Kim used his annual New Year address to warn he has a “nuclear button” on his table, but sweetened his remarks by expressing an interest in dialogue and participating in the Pyeongchang Games. 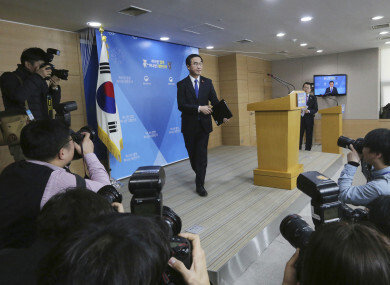 South Korea’s unification minister Cho Myoung-Gyon told a press conference that Seoul was “reiterating our willingness to hold talks with the North at any time and place in any form”. “The government proposes to hold high-level government talks with North Korea on 9 January at the Peace House in Panmunjom,” Cho said, referring to a truce village in the demilitarised zone separating the two Koreas. Cho added that the specifics of the proposed talks, including its agenda, could be discussed through the inter-Korean hotline at Panmunjom, which has been cut off since 2016. The Koreas, divided by the demilitarised zone since the end of the 1950-53 Korean War, last held high-level talks in 2015 in an effort to ease border tensions. Those talks were led by then-South Korean national security adviser Kim Kwan-Jin and his North Korean counterpart Hwang Pyong-So but failed to reach an agreement. “Just the fact that they are meeting will be meaningful because it signals an attempt on both sides to improve relations,” said Koh Yu-Hwan, a political science professor at Dongguk University. But once they sit down, the North could put Seoul in a difficult position by making unacceptable demands such as an end to the annual joint military drills with the United States, Koh added. “What North Korea is trying to do is re-establish its relations (with Seoul) as a nuclear state. The South’s dilemma is whether we can accept that,” Koh said. Dovish South Korean President Moon Jae-In, who has long favoured engagement to defuse tensions with the North, earlier Tuesday welcomed Kim’s suggestion that there could be an opportunity to kick-start dialogue. However, he indicated that improvements in inter-Korean ties must go hand in hand with steps towards denuclearisation of the North. Moon proposed Red Cross and military talks last year, but Pyongyang did not respond. North Korea has rattled the international community in recent months with multiple missile launches and its sixth and most powerful nuclear test — purportedly of a hydrogen bomb. It has shrugged off a raft of new sanctions and heightened rhetoric from Washington as it continues to drive forward with its weapons programme, and has said its arsenal is for defence against aggression from the US and its allies. Kim’s comments yesterday were the first indication of North Korea’s willingness to participate in the Winter Games, which run from 9 t0 25 February. Moon called them a “positive response” to Seoul’s hope that the Pyeongchang Olympics would be a “groundbreaking opportunity for peace” and urged officials to come up with measures to realise the North’s participation. The main venues for the Games are just 80 kilometres (50 miles) from the heavily fortified border with North Korea and the build-up to the event has been overshadowed by the nuclear weapons standoff. In his speech yesterday, Kim said the Olympics could provide a reason for officials from the neighbours “to meet in the near future”. “Since we are compatriots of the same blood as south Koreans, it is natural for us to share their pleasure over the auspicious event and help them,” Kim said in his address. Seoul and the Games’ organisers are very keen for the North to take part. Analysts say North Korea’s participation at Pyeongchang is likely, given its leader’s public remarks about sending a delegation there. Email “South Korea offers high-level talks with North in demilitarised zone”. Feedback on “South Korea offers high-level talks with North in demilitarised zone”.